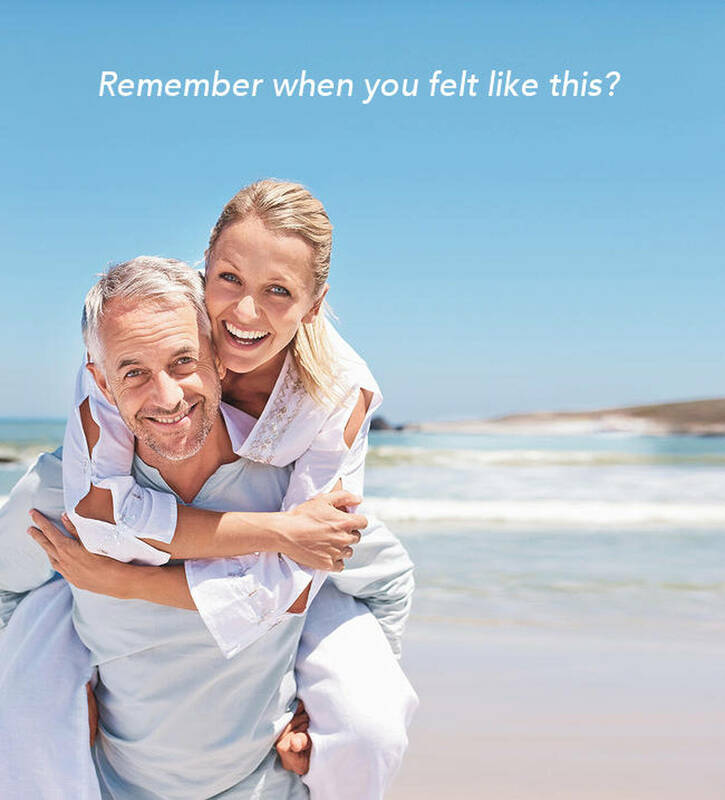 The RESTORE Ultra-Rapid Infusion…The "Gold Standard"
Do you remember what it feels like to be…strong, confident and alive! Think back, to a time when you felt good. You had all the energy in the world, you could concentrate and think clearly and the day just seemed brighter. Remember when you were sleeping well, felt rested and your body didn’t ache and hurt all the time. A time when going out with friends was fun, you felt happy, content and comfortable in your own skin. Your relationships were better; work was easier and you weren’t tired all the time. You could function normally, like other people do, and enjoy life. Wouldn’t it be great if you could feel that way again? The Ketamine Institute, is a world-recognized leader and pioneer of ketamine-based therapy with the – RESTORE Ketamine Infusion –the new "Gold Standard" in ketamine therapy. RESTORE Infusion Therapy is widely recognized as the most effective, longest lasting ketamine therapy available in the world. 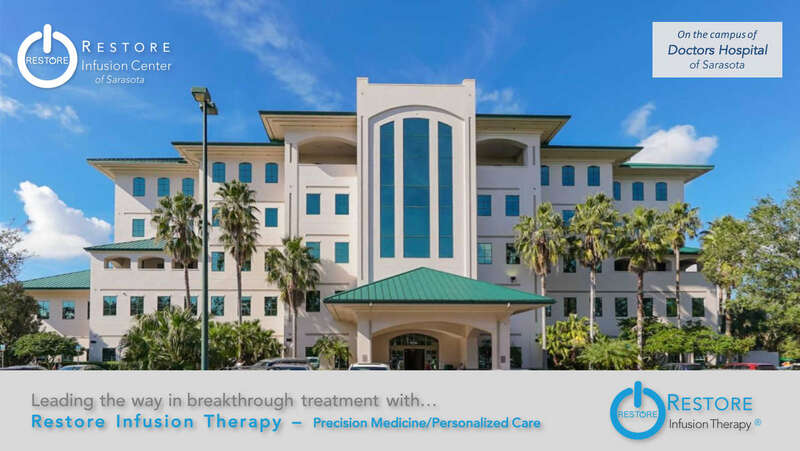 In only 3 days with 3 personalized/precision medicine treatments, up to 85% of patients with “treatment resistant” conditions including depression, migraines or chronic pain obtain relief and see dramatic, long-lasting improvement with RESTORE. "In August I was in the worst depression of my life, feeling as if it would never end….While researching ketamine infusion centers we came across Ketamine Research Institute. The doctor spent an hour on the phone with us and we had an appointment within the week. I had three infusions which literally in every sense of the word restored my life within a week. It can only be explained by a miracle. I am now on the least amount of psychiatric medications I have been since I was 13 years old. I enjoy my life each and every day. Don’t get me wrong everyone has their ups and downs and I do, but I’m able to brush it off. I’ve been given the gift of being able to smile a real true smile again! Our patients come to us from across the nation and internationally with some of the most difficult and complex illnesses imaginable. Many have suffered from severe depression, anxiety, or PTSD. Others have experienced painful neuropathy, migraines or fibromyalgia for years and have not found relief with standard treatment. Still others have deal with pelvic pain syndromes including vulvodynia or pudendal neuralgia without relief. Often, theses people were classified as “treatment resistant” and offered little hope. But even in these extreme cases, the RESTORE Ultra-Rapid Infusion can be rapidly effective. In just 72 hours, after only 3 infusions, patients’ can begin to feel better, become more active and enjoy life again. Not only do they feel better more quickly, but also benefit from long-term improvement. Why is the RESTORE Ultra-Rapid Infusion So Effective? It is becoming common knowledge that ketamine is the most effective and rapid treatment available for many disorders including depression, anxiety and PTSD. Even the major drug companies, including Johnson & Johnson, Janssen and Allergan are stopping research into older antidepressants and rushing into the development of new drugs that they hope will come close to duplicating the rapid and remarkable benefits of the ketamine infusion. There is little wonder why this is happening when you consider the dramatic improvements that can occur in just 24 hours after just a single infusion. There are no current medications or treatment that can match the seen with ketamine. What About The New Nasal Spray - Esketamine? While the pharmaceutical companies are trying to make something almost as good as ketamine, the results have been disappointing. Although Esketamine (Spravato), the new Janssen Pharmaceuticals nasal spray, has recently been FDA approved for the treatment of certain forms of depression, it has been found to be significantly less effective and much more expensive than a ketamine infusion and is also noted to produce more frequent and longer lasting adverse side effects. Spravato appears to be an improvement over current conventional antidepressant medications, although it was only able to produce somewhat positive responses in 3 out of 5 FDA phase III trials. In those studies, people who received intra-nasal esketamine improved slightly more than those that took a placebo (inactive spray). A number of those patients also reported negative side effects that could last almost 2 hours after taking the nasal spray. It would appear that after all that research and development, esketamine may not be the "breakthrough" new treatment they were hoping for but it is a step in the right direction. While we do not believe Spravato is nearly as effective as ketamine, we are a Spravato Certified Center and can provide the treatment. 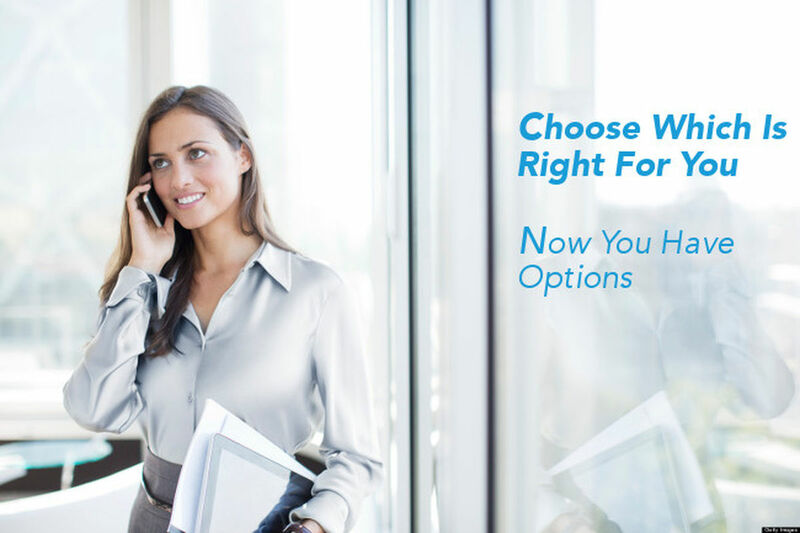 Please contact Janssen CarePath to determine if your health plan will cover the cost of the medication at 844-777-2828. Even the "standard" ketamine infusion, developed in 1994 and used by many private centers, universities and the National Institute of Mental Health is not nearly as effective as it could be. Any positive benefits achieved after 6 infusions only last a few short weeks before patients need another treatment. Then they need to continue to have regular infusions, usually every month, to maintain improvement. Rather than changing what we already know works well or being satisfied with the standard infusion…we unlocked the full potential of ketamine and made it even better and longer lasting! RESTORE is the new "Gold Standard" in ketamine infusion therapy. It may come as a surprise, but not all ketamine infusions are the same. Although people might say that ketamine is just ketamine, and that is generally true, there is a little more to it than that. Like anything else, depending upon how you use it, the results can be very different. Just as electricity is electricity, what you can do with it depends on how you use it. You can use it to light your home, make a phone call or access the internet. The same holds true for ketamine. Understanding this, we have used it in many different ways over the years to learn more about what it can really do. As a result of our efforts, and after years of clinical use and research, we have developed proprietary ways to increase ketamine's effectiveness and extend the remarkable benefits months to years. 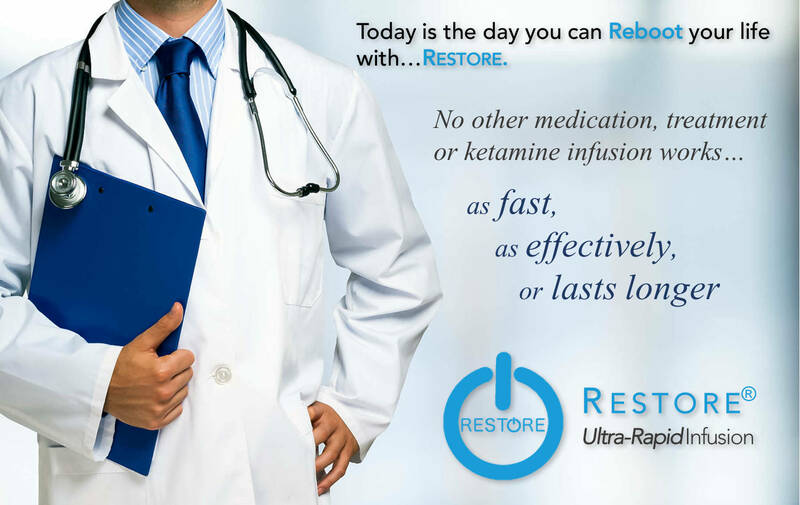 RESTORE represents the new "gold standard" in ketamine infusion therapy. We are the only center in the United States that offers both the Yale-National Institute of Mental Health ketamine infusion, also known as the “standard ketamine infusion", as well as, the advanced and more effective RESTORE Ultra-Rapid Infusion. And soon...there will be a third choice - The RESTORE Essential Infusion. Just as we all know that no two people are exactly alike, we also know that they will not each respond to medication in the same way. Because of this, it is important to select the right treatment for the right person to be maximally effective. Today in medicine, it is becoming more common to hear of something called “targeted treatment”. This new form of therapy considers individual differences in each patient and specifically tailors treatment to that person’s unique circumstances and it is equally important when considering ketamine therapy. Until now, most medical treatments, including the standard ketamine infusion, have been designed for the “average patient.” As a result of this “one-size-fits-all” approach, treatments can be very successful for some patients but not for others. Our approach differs from the traditional one and we take the time to tailor our unique therapy to each patient, incorporating many factors that others often do not include. This is new approach and way of viewing things is known as “Precision Medicine”. Precision Medicine takes into account individual differences in people’s genetics, metabolism, medications, life experiences, environments, and lifestyles. It gives us the resources and information we need to target the RESTORE Ultra-Rapid Infusion to each person’s needs and the specific illnesses. Success requires time, expertise, experience and attention to every detail…that’s Precision Medicine. The RESTORE Ultra-Rapid Infusion is unique and was developed during the years 1998-2004 from earlier clinical research work utilizing ketamine to treat complex and severe, neuropathic pain. Realizing the difficulty with multiple infusions given over a two-week period and the time consuming need to return each month for “booster” infusions, RESTORE was specifically developed to be more effective, faster acting and longer lasting than the standard ketamine infusion. RESTORE Ultra-Rapid infusion has been found to be very effective in up to 85% of our patients. As a group, they have all suffered from severe and unremitting depression, anxiety or PTSD and have been unable to obtain relief with standard therapies. This includes not only all current antidepressants and psychotherapy but even magnetic stimulation (rTMS) and electroshock therapy (ECT). They were all classified as “treatment resistant” and offered little hope. Many of them have been told by well-meaning doctors that “you just have to learn to live with it” and “there’s nothing more we can do”. Even in these extreme cases, RESTORE Ultra-Rapid can be very effective. 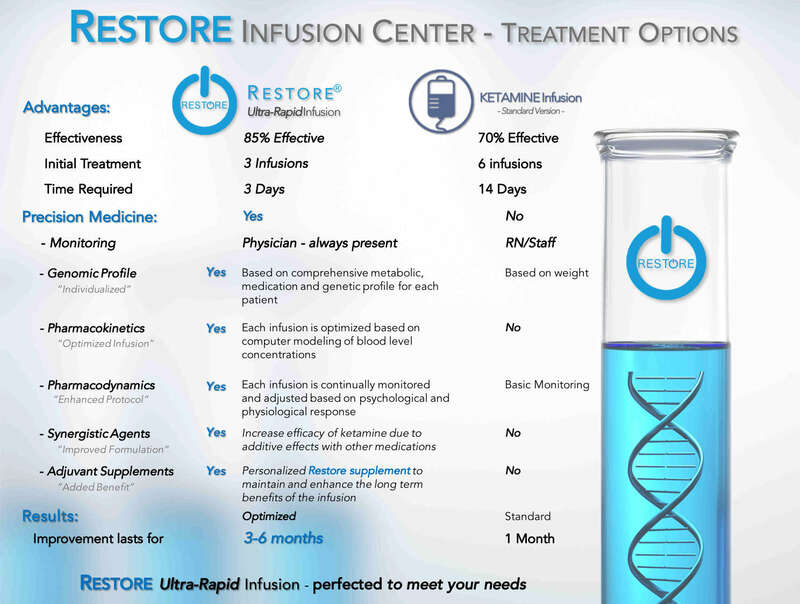 Using a proprietary treatment paradigm and protocol combining Precision Medicine (including each patients’ medical history, genetic and metabolic profiles, and unique individual characteristics) with Personalized Care (minute-to-minute physician observation and optimization of blood levels during each infusion), as well as, the unique Restore supplement the RESTORE Ultra-Rapid infusion represents a remarkable advance in effective, efficient and long term improvement ketamine therapy. The initial treatment series is just 3 infusions, one every day for 3 days. Patients then begin to experience rapid relief and the improvements last much longer. After that, RESTORE patients can do so well that they may only need just two maintenance infusions. One at the 3-month mark and one a the 6-month mark. Following this, no other maintenance infusions are usually required. Some patients, depending upon individual circumstances and conditions, may request or need occasional maintenance infusions on an “as-needed” basis. So, if time is a factor or your condition is complex, severe or of long duration then the RESTORE Ultra-Rapid Infusion may be a better option. The obvious advantages of the RESTORE Ultra-Rapid Infusion are that it is faster, more effective and longer lasting. 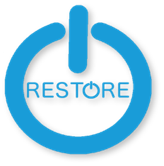 RESTORE offers a long-term solution and improvement as opposed to short term benefits of the standard ketamine infusion. But more than that, the RESTORE Ultra-Rapid Infusion can successfully treat not only mood disorders but also migraines, fibromyalgia and painful neuropathy, while the standard infusion cannot. Many have also found substantial relief from pelvic pain and associated vulvodynia and pudendal neuralgia with RESTORE. It is also remarkably effective for one of the most difficult to treat and painful conditions known: complex regional pain syndrome or CRPS/RSD. Through our clinical research, we are beginning to find that it may also be helpful in Alzheimer's, Neurodegenerative disorders such as Parkinson's Disease and MS pain syndromes. "Rock bottom and out of options is where I found myself in 2016. Suffering from 2 to 3 partial/myoclonic seizures per week, intractable migraines and severe clinical depression, had left me broken and struggling to find the will to keep going. I went through years of the awful gauntlet of tests and prescription meds whose side effects were as horrible as my conditions and did nothing to relieve my symptoms. My quality of life, due to all my health issues, had slowly disappeared and with 4 amazing children to care for, all hope had left me. Then one day I came across a report about Ketamine therapy on NPR radio and started researching and was quickly led to the Ketamine Institute and Restore. After having years of awful experiences with neurologists, I was absolutely blown away by their balance of professionalism and impeccable bedside manner after our initial phone call. That first treatment gave me my life back! The entire experience is absolutely incredible. They truly focus on treating the whole patient and are there guiding every step of the way. Best decision of my life." Undertaking any form of new therapy or treatment for a serious medical condition can be a concern for you and your family. So, before you consider ketamine treatment with anyone, find an experienced and trained physician, ask a lot of questions and be satisfied with the answers. Unlike other centers, I personally evaluate, select and treat each and every patient at the Ketamine Institute. I administer each RESTORE Ultra-Rapid Infusion myself and only see one patient at a time, so you have my full attention throughout the entire process. We spend a great deal of time with our patients before, during and after all RESTORE infusion sessions. This is a comprehensive and specialized treatment, so we take the time that you need to obtain the best results. The Ketamine Institute was founded to continually improve and perfect ketamine treatment for an expanding range of chronic illnesses. 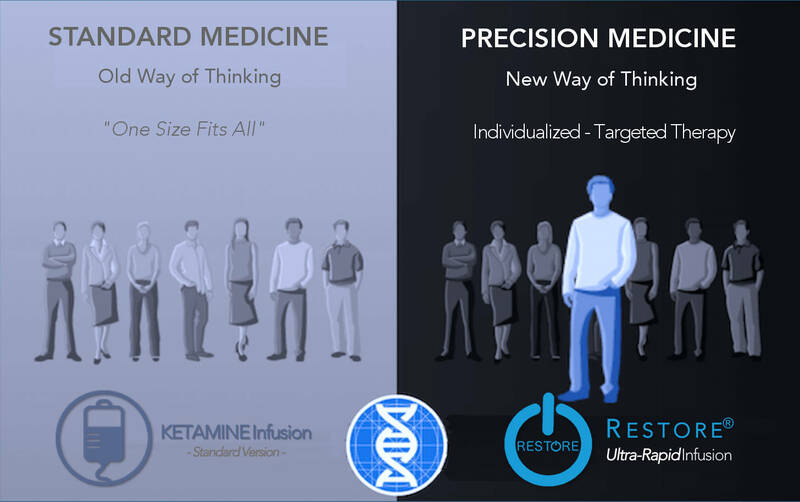 After devoting almost 2 decades to the clinical use, research and development of this innovative therapy, employing precision medicine and targeted therapy, we have developed the most advanced ketamine based therapy available in the RESTORE Infusions. We have improved on the original standard ketamine infusion, making the RESTORE Ultra-Rapid Infusion the most effective, efficient and longest lasting treatment available. We are a very specialized center devoted exclusively to ketamine treatment and educating physicians in the use of ketamine. We focus solely on ketamine therapy to ensure that you have the best possible opportunity to improve with our infusions. More than that, we are leading the way in the field of ketamine infusion therapy and physician education by establishing the first International Training Program for Physicians in Ketamine Infusion Therapy. 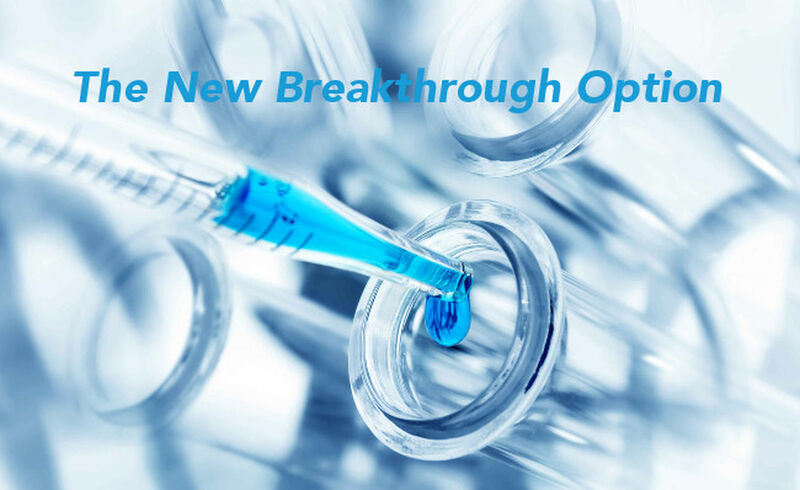 Our hope is to bring this remarkable breakthrough therapy out of the research lab and into your physician's office. "We are committed to what we do. We will use all our knowledge, experience, training and expertise to help you. And while we cannot promise success in every case, we can promise and guarantee, that we will make every effort and take every step necessary to ensure that you have the best possible chances of recovery”. Our new location on the campus of Doctors Hospital of Sarasota enables us to provide you with an integrated healthcare environment offering a broad range of medical expertise and services immediately available. Cooperation among your physicians is a very important element when dealing with complex illnesses and we work closely with your physician and those on our campus to bring you the best possible care. Learn more about the RESTORE Infusion Therapy difference. Time is precious. You want to feel better as fast as you can and we do too. The RESTORE Infusion program only takes 3 days; not 2 weeks like other infusion programs. Better yet, we offer weekend treatments, so you can begin on Friday and be home on Sunday. Why spend all of your time and money waiting for 2 weeks to feel better? Call us today or submit this request for a confidential consultation.